If you are curious about the latest digital trends and how that innovation is being implemented into real world communication needs, don't miss this webinar. 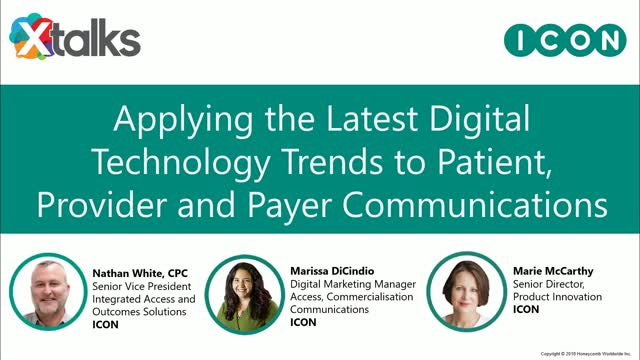 We review current trends and how digital technology and innovation are being applied to patient, healthcare professional, payer, and other decision maker communications. With a world population of 7.6 billion people using over 21 billion internet connected devices, digital interactions are not only fundamental, they require continued evolution to maintain appropriate reach and responsiveness. You’ll gain insights from our collection of case studies, and learn how companies are applying the latest digital trends in Artificial Intelligence (AI), including voice enablement and chatbots, wearables, point of care electronic health record messaging, social media, transportation, do-it-yourself healthcare, and more. The new European Medical Devices Regulation (MDR) and the In Vitro Diagnostic Medical Devices Regulation (IVDR) represent some of the most wide-ranging and disruptive changes to recently affect the world’s second-largest medical technology market. Now, with just a two- to four-year transition period before full compliance is required in 2020 for MDR and 2022 for IVDR, device developers will need to implement changes to help new and existing products succeed. Risk based monitoring has been emerging for years. The 2017 release of ICH E6 R2 introduced the world of technology to a 20-year-old guideline with increased focus on delivering quality and efficiencies in clinical trials. This webinar explores the evolution of centralised, risk based monitoring, specifically addressing the impact on sites, examining the growing pains, and fostering dialogue and awareness between CROs, sponsors and sites. A short questionaire to assess alcohol use. Overview of current challenges associated with NASH Clinical Trials and examination of potential strategies to address during trial design or study execution. The shift towards a value-based, patient-centric approach to health care continues to increase the need to measure the impact of biopharma products and devices in a real world setting. It’s now more important than ever for sponsors to understand how Real World Evidence (RWE) can play a role in developing a product’s value story across the development continuum. Payment models and federal reforms are increasingly focused on the real world impact of treatments and devices. Regulatory bodies are looking to real world evidence to close the gap between how a product performed in clinical trials and how a product performs in the clinical setting on a broader patient population. As the capture and connectivity of health records and data continue to move towards digitization, the ability to assess and analyse these data increases in ease and efficiency. Innovative late phase research approaches are benefitting from this move towards digitization, at the same time as more regulatory guidance is released in both the US and EU around the use of RWE to support and enhance submissions and product uptake. Combined, these two activities are making a high impact on the importance of assessing and realizing a real world evidence product strategy. The increased interest in RWE not only lies with regulatory bodies, however, it also stands to make a large impact on how payers may cover a product based on the real world value it brings to the patient and the market. Understanding what evidence will best support a product’s value story is paramount for sponsors to ensure payers can make an informed decision about the product’s impact in a real world setting. Developing scientific publications and manuscripts is a complex and time-intensive process. Each publication often involves managing multiple authors and KOLs through numerous review rounds, while gathering actionable and meaningful input and meeting stringent publication deadlines. Join us to learn good publication practices that will help to streamline your interactions with scientific authors, while enhancing the quality, efficiency and effectiveness of your industry sponsored research projects. Easy to use technology solutions that provide compliant and efficient means to support your strategic and tactical publication management processes. In these days of austerity, a new healthcare intervention, defined as a drug, medical device, procedure, program, or service, must establish a robust and credible value proposition before or soon after its introduction into mainstream practice. Various healthcare stakeholders have different requirements for and definitions of value. Satisfying their demands is paramount to an intervention’s success and results in more favourable pathways to rapid adoption and market access. Join us as we discuss an approach to evidence-generation strategies in drug and medical device development that enables integrated teams to develop and implement targeted and effective value propositions. Launching a new drug often requires a compromise between the manufacturer and payer’s objectives and priorities. While ensuring patient access to new drugs is an objective for both parties, payers also need to make certain that new therapies comply with budgetary constraints and that any associated risks of uncertainty are minimised. In this context, contracting represents mutually valuable agreements that address the needs of both the manufacturer and the payer. Traditional contracting agreements have focused purely on price negotiations. These simple agreements such as, price discounting/rebates, caps and free goods, in themselves are not novel; however, their combination or inclusion in the context of a more complex agreement can be considered in the design of innovative contracting agreements. When designing a contract, the aim is to find a cohesive solution that meets the needs of the payer while still achieving manufacturer objectives. Sometimes, “traditional” contracting is not sufficient to achieve this compromise, necessitating the adoption of more advanced, and sometimes complex, innovative contracting agreements. With the increasing drug development cost, shift from volume to value-based pricing, and competition from generics and biosimilars, pharma and life science organizations are looking towards real world evidence (RWE) to prove the value – cost, safety, and effectiveness of their medicinal products. However, the current real-world data comes in structured and unstructured format, in various data standards, and is laden with varied data quality issues. The industry is looking to define a platform-based approach to address the functional and technical complexities of RWE and harness the real-world datasets across the pharma value chain. Health economic models are required to demonstrate product value and support reimbursement submissions; however, early economic models can also be used to inform clinical development decisions, develop HEOR and real world evidence (RWE) generation planning and support early pricing and market access discussions. While open access journals bring clear cost and accessibility advantages, it is important for authors to be able to accurately assess the quality and reputation of any potential publisher. Predatory publishers are profiteering individuals or companies, who use the open access publishing model to take advantage of and exploit authors, by charging them article processing fees without providing the high quality editorial services associated with legitimate journals . The term “predatory publisher” was first coined by Jeffrey Beall, who tracked them on his Scholarly Open Access blog from 2012 until January 2017. With demand increasing for new and innovative approaches to late phase research, technology solutions and access to RWD are at the forefront of creating efficiencies in all stages of study design and implementation. But what steps should you take in study planning to ensure these efficiencies are effectively applied? And how can you partner with CROs to ensure that the secondary and primary data are pulled through the appropriate technology solutions for optimal use? BioPharma companies and Medical Devices manufacturers face growing operational, regulatory and economic challenges when it comes to developing their drug or device. ICON provides analysis and key insights on these challenges, with practical advice and recommendations.